Nozza Luciano is a farm in the province of Bergamo that has been producing and marketing flowers since 1984. Thanks to the farm’s high-tech greenhouses, over 4,000,000 seedlings of different varieties are transplanted and marketed each year. The management of the plants is diversified according to their phenological stage, as younger plants need warmer temperatures, while mature ones require more ventilation and milder temperatures. Nozza Luciano Floriculture’s interest in obtaining plants with better aesthetic and commercial characteristics, particularly in the period from late autumn to early spring, convinced C-LED to conduct a new trial. 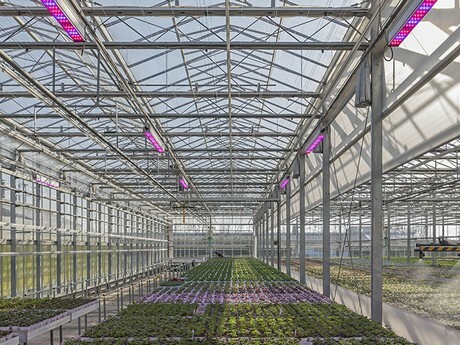 Together with the University of Bologna, which performs specific floriculture experimentations using artificial LED lighting, it is now possible to validate scientific results obtained directly in large professional environments managed by industry experts, with a large quantity of plants. The study is being conducted in latest-generation greenhouses in Bergamo, and focusses on various ornamental varieties. 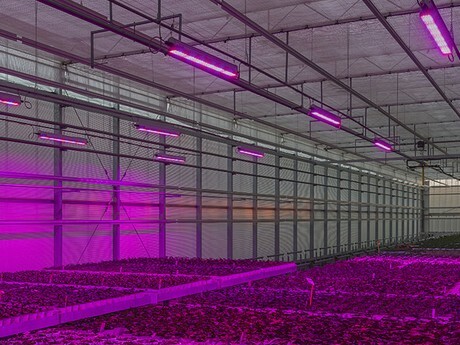 The special C-LED PLUS series Toplight lamps, 150 watt each, positioned at the right height above the benches, provide an adequate quantity of light to the plants. At the same time, the Bloom light spectrum (specifically for ornamental varieties) ensures proper flower formation and development, with a compact plant habit. The most important aspects of the work implemented by C-LED are the flowering time, compactness, flower colour and plant habit. The trials on specific spectrums for each plant type are conducted during the winter period, until spring. During this time, plants have been grown with extremely improved morphological (and thus commercial) characteristics, as was expected in the light of previous tests. In European latitudes, winter is a particularly critical season for the quality of ornamental plants, and commercial categories that normally discriminate between cultivations based on aesthetic and morphological characteristics adopt more flexible parameters. Over the course of this season, in fact, smaller dome diameters are accepted than in summer time, or shorter stems and a smaller number of open flowers, all in order to accommodate the needs of the flower growers, who are unable to fully satisfy the light requirements of their plants.